Welcome to Hotel Perren in Zermatt, the family-run establishment at the foot of the Matterhorn. The typical Zermatt atmosphere is tangible throughout our friendly family hotel. The Perren, Bregy and Kronig families and their team attend to your individual requirements. 70 comfortable rooms are available. 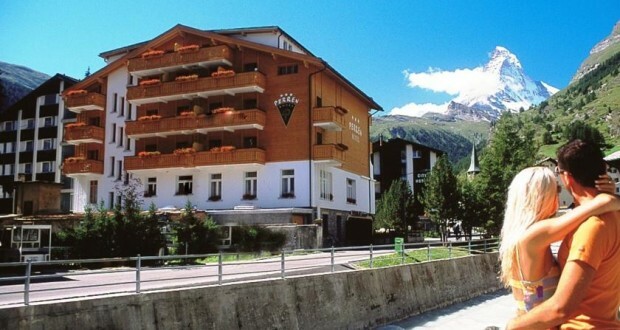 These are classified into Deluxe, Comfort and Family rooms, the Matterhorn Suite, and a spacious holiday apartment. You can relax and unwind with a view of the Matterhorn in our “Garden of relaxation” wellness facility with wood sauna, stone sauna and aroma grotto. And let’s not forget Isa’s Beauty Corner and the Fitness Centre in the neighbouring building. Spend your holidays in Zermatt. Skiing in Zermatt is an all-year sport. If you enjoy hiking, you have more than 400 kilometres of hiking trails to choose from. The half-board restaurant LA MONTANARA and the a-la-carte restaurant LA BARRIQUE offer local and international specialities from the kitchen and wine cellar every day. After an eventful day in the mountains, while away the evening with champagne, selected wines and our own cocktail creations and enjoy the relaxed atmosphere in our unique “Q-STALL BAR”. The friendly team at Hotel Perren in Zermatt is looking forward to your visit.